← Jon Sealy. The Whiskey Baron. Spartanburg, SC: Hub City Press, 2014. Elizabeth Spann Craig. A Body in the Backyard. United States: Elizabeth Spann Craig, 2013. Octogenarian Myrtle Clover has finally gotten her yardman, Dusty, and his wife Puddin over to work on her house in the fictional town of Bradley, North Carolina. Puddin might not make a great housemaid but Dusty does a good job on the yard, whenever they make it over to Myrtle’s. So, Myrtle’s excitement is dampened just a bit when Dusty discovers a body in her backyard. Of course this provides Myrtle with the perfect excuse to get some information on the case. But, it also gives Dusty and Puddin an excuse to stop their work. And Myrtle can’t help but be disappointed in herself for having no idea that a murder occurred in her own backyard. Myrtle’s neighbor and closest friend Miles soon identifies the victim as his cousin Charles. Cousin Charles isn’t the kind of cousin you claim, he’s the black sheep that you hope never gets mentioned. Myrtle and Miles suspect that Charles had come back to Bradley to beg Miles for money. But Myrtle and Miles soon discover that there are a few people who would have had a motive to kill Cousin Charles, including a cuckolded husband, a scorned woman, and a protective father. When the protective father, Lee Woosley, turns up murdered in Myrtle’s backyard as well, Myrtle’s son, Red, starts to be concern for her safety at the house. In order to scuttle Red’s plan to send her to Greener Pastures Retirement Home, Myrtle knows she must solve this mystery fast. In their search for the murderer, Myrtle and Miles discover that Miles wasn’t the only one hiding his connection to Cousin Charles–there may be even more suspects to consider. A Body in the Backyard is the fourth title in the Myrtle Clover Mysteries. 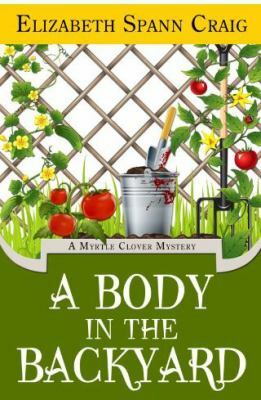 Myrtle Clover has an uncanny talent for finding bodies in her small town, so it’s a good thing she also has the ability to solve these crimes.